The 2015 Jeep Cherokee is a whole new kind of Jeep; in fact, it's a whole new kind of compact crossover. Whether you want to go galavanting in the back woods or just like the rugged good looks of a Jeep, Sulphur Springs Chrysler Dodge Jeep Ram understands. Our staff is standing by to help drivers like you in Tyler, Sulphur Springs, and Greenville, TX find the perfect model. The 2015 Jeep Cherokee features a new, efficient front/all-wheel drivetrain, but Jeep went one better and engineered theirs with a two-speed transfer case for better performance during real off-road use. The Cherokee comes standard with a 2.4 liter four-cylinder rated at 184 horsepower, or offers an optional 3.2-liter V6 which makes 271 horsepower. Both powertrains come linked with a nine-speed automatic transmission for extra smoothness on and off-road. Front-wheel drive is standard, but two different all-wheel drive systems are available: Active Drive I or Active Drive II (with low range), both offer user selectable modes for different terrain. The EPA estimates that four-cylinder FWD Cherokee models earn 22 city, 41 highway mpg. Properly equipped, the 2015 Cherokee can tow up to 4,500 pounds. 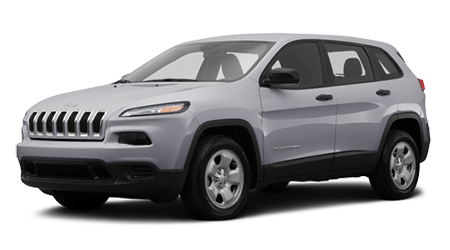 The 2015 Jeep Cherokee features four separate trim levels: Sport, Latitude, Trailhawk, and Limited. The Sport is nicely optioned with AC, tilt/telescope steering, power windows and locks, keyless entry, and a six-speaker stereo. The audio system also includes a 5" touchscreen with Bluetooth, iPod/USB compatibility, and auxiliary input. Latitude models add 17" alloy wheels, automatic headlights, fog lights, rearview camera, tinted windows, and an 110-volt outlet. Additionally, the Cherokee Latitude allows you to select the V6 option, among others. The Trailhawk is the AWD-only trail rated version and, as such, brings special off-road suspension and tires, a locking rear differential, skid plates, tow hooks, an upgraded infotainment system with 8" touch screen, and more. There are optional Comfort/Convenience packages and Technology packages as well. The Limited comes fully loaded with 18" wheels, power-adjustable heated leather seats, and a heated steering wheel. On top of all those features is an available Luxury Package and Technology Package. All Cherokees offer a Tow package with factory-installed hitch, wiring, and transmission cooler. The 2015 Jeep Cherokee may not be the kind of 4x4 you are used to, but you'll love just how good it performs off-road, while still retaining amazing on-road manners. Need a small SUV to get out of Tyler or Sulphur Springs and into some backcountry? Visit Sulphur Springs CDJR and test drive the Cherokee.